One of the new features in iOS 11 that catches your eye is the new large titles. 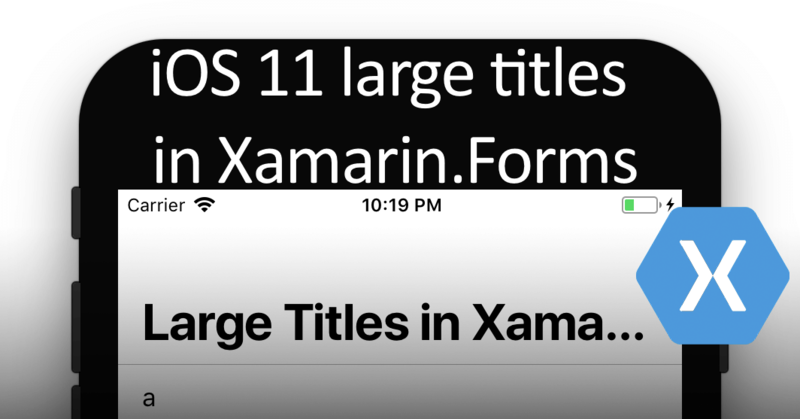 With iOS 11 just released, I’m sure you want to incorporate the latest features into your own Xamarin apps. In this short post I will show you how. Update: see below for an easier way to do this, built-in to Xamarin.Forms directly! In iOS 11, you will notice that the stock apps will suddenly show you a large title that crawls up to the bottom whenever you scroll up. You can see it in action in the below screenshots, showing the Message app in iOS 11. You could argue about whether or not you like it, but Apple has decided, so we’re probably doing to have to like it for the years to come. Personally, I had to see it a couple of times, but now I like it! Apple chose not to enable it by default for all navigation pages, so you will have to enable it yourself. I took a few minutes to find out how, and of course I will share it with you! It’s actually very easy. We have to create a custom renderer in the iOS project, which renders the NavigationPage. Or, if you want to use it for just one type, create your own inheritance. You can see the code below. The example code for this project can be found here: https://github.com/jfversluis/LargeTitleSample if you need a working app. If you do this on a NavigationPage, all pages within that NavigationPage will leverage the large titles. You can also do this on a ContentPage, then it will just work for that page. I hope you liked this post! Please be sure to come back for more, and while you are at it, check out my Gur.Codes(); vlog channel as well. Thanks for this! very concise and it helps to get on track on the new design principle. In a view I have UITableView and a UITabBar…when I scroll up the big title go into NavigationBar but the problem is that even the UITabBar move up, leaving white space in the bottom. and you have either a scroll view or a list view or anything, there is an extra white space at the bottom. I don’t know much about the platform specifics but I’ve read that it’s rather easy to implement the search bar in the new large titles. Hi Alex! Thanks for reading! Could you reach out to me at gerald@verslu.is with a more detailed explanation of what you are trying to do?